The Fight Against Global Greening – Part 3 | Watts Up With That? In Part 1, we looked at the question of the relationship between increased photosynthesis and food production (Zimmer’s #1). In Part 2, we discussed the claim that “extra carbon dioxide can make plants less nutritious”. “It’s not just strawberries and other crops that are taking in extra carbon dioxide. So are the forests, grasslands and other wild ecosystems of the world. When scientists take into account both extra photosynthesis and respiration, they estimate that plants remove a quarter of the carbon dioxide we put in the atmosphere. Even more remarkably, the plants have been scrubbing the same fraction of carbon dioxide out of the air even as our emissions explode. “Every year we build more power plants, and every year the plants take out more CO2,” Dr. Campbell said. But that isn’t cause to celebrate. It’s a bit like hearing that your chemotherapy is slowing the growth of your tumor by 25 percent. Despite global greening, carbon dioxide levels have climbed over the past two centuries to levels not seen on Earth for millions of years. And the carbon dioxide we’ve injected into the atmosphere is already having major impacts across the planet. The six warmest years on record all occurred after 2010. The weather has already become more extreme. Sea levels have risen. The oceans are acidifying. If plants keep on absorbing only a quarter of our carbon dioxide in the future, then we can expect all these trends to get stronger. Now, if any other process could be credited with removing a full 25% of all CO2 emitted by mankind every year, year after year, it would be labelled heroic. Governments and laboratories are fielding schemes to hopefully remove fairly small amounts of CO2 or to prevent them from being emitted in the first place — these pages here at WUWT feature these ideas, one after another — schemes to convert CO2 into rocks, capture CO2 into fuels like ammonia, capture and store CO2 in caves and oil wells. Just imagine for a moment that we were talking about China reducing its CO2 emissions to zero overnight. This is what Global Greening is currently doing, cost free. “But that isn’t cause to celebrate. The reduction of CO2 emissions by an entire “China’s worth” is “not a cause for celebration”? Apparently, for Zimmer and Campbell, all of the Paris Agreement targets, even if actually being met by any country, would also not be “cause to celebrate”. After all, they only slow the growth of atmospheric CO2 , they do not eliminate it altogether. His position is simply paraphrased as: “There is no good in removing CO2 from the atmosphere unless you can entirely stop its concentration from growing.” With this he has thrown the entire Paris Agreement effort under the bus. What effect does Global Greening have on atmospheric CO2 concentrations? Zimmer and Campbell have stipulated [agreed without the necessity of argument] that Global Greening removes from the atmosphere some about 10 billion tons of CO2 annually. Not only that, but it keeps removing more each year as the globe greens. This graph, from UCSD/Scripps, represents the Earth’s “breathing” — in the Northern spring and summer, growing plants remove CO2 faster than we emit it and the monthly data points go down. As growth slows in the mid-summer and through winter, plants don’t take up as much CO2 and emissions get ahead. The Southern hemisphere does not have as much an effect on the graph as does the Northern hemisphere. We see though that as Global Greening takes hold, it takes up more parts-per-million year to year — in the 1960s, the seasonal difference was 6.2 ppm, by 2018 it has risen to 9 ppm. The other thing that is obvious is that CO2 concentrations (in ppm) continue to rise as modern societies (and Nature) continue to emit more CO2 than increased plant photosynthesis takes up. Since 2000, from the first chart above, the annual increase in ppm of seasonal uptake of CO2 has been about 0.125ppm/year — or 1/8th of a ppm per year. In eight years, that increase is 1 ppm. But CO2 is increasing at an average rate (2010-2017) of 2.54 ppm/year. Global Greening will not catch up at these rates, will not stop and will not reverse the increase of CO2 atmospheric concentrations by itself. Global Greening, by itself, will not stop the rise in atmospheric CO2. Now that we’ve got a good handle on the facts, let’s revisit what claim Zimmer was attempting to refute with his odd claim that “Global Greening is terrible because “More Plants Won’t Prevent Climate Change””. Did anyone ever claim that Global Greening would prevent climate change? “Climate change denialists were quick to jump on Dr. Campbell’s research as proof that increased carbon dioxide is making the world a better place. Zimmer engages in a journalistic trick — he jumps in with both boots to refute something that was never claimed in the first place — no one ever claimed that Global Greening would stop climate change. How many things can you list that are good that will not stop climate change? World Peace, an AIDS vaccine, ending poverty, an unbiased press. The list is pretty long. None of these would be terrible just because they don’t stop climate change, and neither is Global Greening. It is not that Zimmer and Campbell don’t have a valid point — they do, but they don’t state it and they don’t use it — they do something illogical and try to establish a falsehood as true instead. It would have been simple enough to say that, from their viewpoint, while Global Greening may be a positive side effect of rising atmospheric CO2, their concerns about the potential negative effects of global warming/climate change lead them to continue to believe that rising atmospheric CO2 is, on balance, a negative thing, a bad thing, and in their odd choice of words, “terrible”. We could accept that — they are allowed to have a point of view and to state it along with their reasoning for holding that viewpoint. But Zimmer seems to have allowed himself to be swept up by emotion-fueled advocacy — his need to fight “climate change” at any cost — and lost his thread of rationality, abandoned his journalistic ethics and destroyed my respect for him as a science journalist. Had he been writing on the Opinion pages of the NY Times, as Andy Revkin did, he could bang away with his climate change advocacy to his heart’s content — but personal opinion disguised as facts doesn’t belong in the Science news section of any newspaper. I was saddened by Carl Zimmer’s descent into irrational advocacy. He is a sharp guy and usually writes good science journalism. We often see the same thing here with our readers and their comments — someone who normally writes good comments, makes good observations, raises interesting questions suddenly flips and becomes an irrational advocate blathering illogic about some specialized topic — be it GMOs or Feral Cats. It takes a very strong mind to keep on the rather narrow path of good science, rational thought, critical thinking and logical argument when dealing with a subject about which one is passionate. The ability to do so is a trait we ascribe to scientists — who, because they are human like the rest of us, often let us down in this regard. I hope readers will confine their comments to the subject of this essay. Hint: it is about science journalism, Global Greening good-or-bad, and how advocacy and science reporting must not be mixed. Recently, I have noticed that many readers treat every comment thread as an Open Thread — in which they are free to discuss — and endless argue — whatever is on their minds. This is not true. The Policy of WUWT states: “Some off topic comments may get deleted, don’t take it personally, it happens. Commenters that routinely lead threads astray in areas that are not relevant or are of personal interest only to them may find these posts deleted.” Moderation here is done with a light hand, but the principle of commenting on topic remains. August 17, 2018 in Bad science journalism. Zimmer starts with the presumption global warming is a bad thing, which he has made no attempt to establish. Given that the Medieval Warm Period was rather nice, let alone the interestingly named Holocene Climatic Optimum, were warmer than the present, how, pray tell, is warming bad? and this terrible presumption leads to his terrible tumor analogy. What he needs to realize is that what we have now is a small benign tumor. And the self serving greedy bastards that have are trying to talk us into using chemotherapy in an attempt to eradicate a small benign tumor should have their medical certification taken away. The Earth has a benign epidermal green growth. The green blob however is malignant. Egypt’s Old Kingdom (began ~2,686 B.C. era for 3-6th dynasties) ended ~ 2,181 B.C. era . The following 7-10 th dynasties became known as the First Intermediate Period lasted to ~2,025 B.C. era (which is then when Egypt’s subsequent Middle Kingdom of 11 & 12 dynasties ruled). A feature of Egypt’s brief 1st Intermediate Period was that the Nile’s water level was so diminished that the agricultural productivity of crops sometimes failed. As a consequence provinces were able to assume more rights (ex: tax relief & independantly start rituals), in part to allay episodes of societal rebellion (ex: grain stores broken into). Near East climate during the “early” Bronze Age followed the relative drying climate that began there about 4,000+ years ago. However during the early Bronze Age there were phases of dryness fluctuating up & down. It was not until the “middle” Bronze Age that the Near East resumed a significant dryward trend; which was only ameliorated in the “late” Bronze Age. See Fig. 2 of Riehl’s (2011) “Variability in ancient Near Eastern environmental and agricultural development”; available on-line as free full pdf. Global Greening means more food can be grown locally. More food grown locally lessens food distribution fuel consumption. Less food distribution fuel consumption lessens fuel distribution fuel consumption. Phytoplankton consume CO2 through photosynthesis just as vegetation does. A more robust marine food chain should be included under the Global-Greening umbrella. Increasing whales’ food source is not ‘terrible’, right? The food chain for just about everything that lives in the sea starts with CO2. The exception being those critters that live on geothermal energy. Seems to me the planet is self regulating, at least as far as CO2 is concerned. We give it more, it gobbles it up and grows “Feed me, Feed me now!” (Little Shop of Horrors). Perhaps a problem when we get to the point it can’t gobble it up, say, over 1,000 ppm, but even that’s a stretch as plant life loves the stuff. And at 410 ppm we’re only ~260 ppm away from certain extinction so, thanks, but I’ll suffer a bit of extra heat if it means we move further away from guaranteed death. Thomas ==> I covered oceanic greening in the first essay of this series. Is there any evidence that he had such ethics in the first place? It takes no “ethics” to report correctly on things that you either agree with, or at worst don’t care about. Ethics only show up when reporting on things that you disagree with. MarkW ==> Much of his work is good science journalism. AGW/CC “journalism” is very much controlled by Editorial Narrative at the NY Times — as well as by pressures from the Climate Team. Read andy Revkin’s story from the ClimateGate days. Exactly. Like the claim “NASA really sent men to the Moon”. Why do people agree with the claim? You cannot tell unless you discuss with them. And those teachers were expected to teach us chemistry. Why do we need “oxygen” for? What do we eat, in France? Historically, on a long period, not a lof of food from another continent. Why would we, the animals of Europe, need an oxidizer from another continent to avoid running out of oxygen? Why do people even agree that the Earth is not flat? Apparently, for some people it’s because “science determined that”. It isn’t Simon says, it’s Science says. Tl; dr: It’s difficult to determine without free interactions whether someone who regularly spout truths understand those and where they are coming from or whether he is just parroting someone else. Pushing people out of their confort zone clears things up. I particularly love the term ‘waste’. It is of course calcareous sediment which produces one of the most important resources on earth: limestone. I wonder if the office building, or the city from which the piece was written is defined as waste? There is no waste in the rock cycle. Reminds me of the country song which goes: “If global Greening is wrong, I don’t want to be right”. Now Folk, Jazz, Jazz Classics, MoTown….some Classical but nothing too modern….. They play Jazz in Heaven I’ve been told. Clapton blues all the way for me mate. Love everything really though, especially Aretha (as I think we all do) and of course Paul Simon. Everything from Soul, Cajun, African, ballad, blues, rock, folk……you name it. My wife and I went to see one of his last concerts ever, before he announced his retirement from touring, in the Royal Albert Hall last year. We splashed the cash and got premium seats, what a special night. A tear for Aretha though, not that I’ll admit it to anyone, far less the denizens of WUWT. Hot ==> Clapton acoustic, yes. The Knopfler brothers (Dire Straits)…and the incomparable, B B King (who I saw at the Whiskey-a-Go-Go in 1967 (early show on a Monday, in the eight person audience were Stephen Stills, Neil Young, and Richie Furay, two whores, my buddy and I [definitely under-aged] and one unidentified boozer). If it is the same song you were thinking of, I recall it as Motown, not country. Could have gotten covered, though, either way. One of the reasons “greening” does not automatically equate with restraining changes in rising ambient CO2 levels is because since the early 1980s there has been an increase in the rate of “browning” biomass that do not partake of CO2. And from mid 1990s the rate of “browning” sped up while “greening” continued it’s trend progression. See Pan, et al (2018) data to 2013 study “Increasing global vegetation browning hidden in overall vegetation greening: insights from time-varying trends” free full text is available on-lline. “Error bars”. I think I understand those. It’s like the Factor of Safety (FOS) I was taught in secondary school engineering in the 70’s. Assuming a perfectly built structure, which isn’t possible, hence FOS. I don’t see many of them in the scientific papers presented on WUWT. Are we just supposed to deduct they are included? Although, I’m happy to accept I miss them. What China emits is half of what it plans to emit under its INDC. All the hype about the Paris agreement was designed to conceal that what it truly meant was a ~50% Increase in CO2 emissions by 2030. China doubling and India trembling their respective emissions, meaning that EU and Australian reductions are completely meaningless. But hey, why let facts or truth get in the way of climate activist propaganda on its chosen path of achieving an unelected marxist-socialist global government and the destruction of the free market and capitalist system – as proclaimed and admitted by U.N. spokespeople. boosted the leaf growth on eucalypts in my area, along with a few yrs of decent rains i admit, now we have had Lerp some little bug thats like the scale ones that make a covered “cave’ under a leaf. the trees dropped leaves like billy o.
reckon theyre like cicadas and have a long cycle of appearances and they help cull overgrowth weaker trees and only certain species i noticed. hey, thanks for the +1, I really appreciate it! Few weeks ago I mentioned man made greening of the Sahara desert, they must have found a large underground water reservoir, fascinating images. then zoom out and travel south. Google Earth measures circle’s diameter at half a mile. It is only 160 miles from the Nile but 400′ higher elevation. Perhaps they fly it in at the airport. Wells. Plural. Zooming in, it looks consistent with a well in the center of each circle. As a layman it never ceases to amaze me the numbers that are involved here, and the people. So the great man himself tells us that water vapour is the control knob of global temperature, strange, I know, but the numbers tell us why. Of the total figure, mankind’s CO2 contribution is around 0.12%. That is a staggeringly small number to overpoweringly influence all other greenhouse gases. Even Tyndall said CO2 “is not negligible but relatively small.” consigning it to a bit part player, whilst not even considering man’s minuscule contribution. So where did this idea that CO2 has turned into the mother of all greenhouse gases? It simply doesn’t make sense. But it makes even less sense when it’s put into the context of total atmospheric gases where, as we all know, CO2 is around 0.04%, in which case man made CO2 is around 0.0012%, and if Kit’s numbers are correct, and I have no reason to doubt them, then 25% of man’s CO2 emissions taken up by plant life brings the excess CO2 down to around 0.0009%. Seriously? Are we even capable of measuring atmospheric CO2 down to that tiny percentage in a climate system that doesn’t even mix the stuff very well? Furthermore, my understanding is that CO2 is unevenly distributed across the planet, so where does this magic figure of 410ppm come from? One consistent location seems to be Mauna Loa, “the world’s largest and one of its most active volcanoes – a giant shield volcano on the Big Island of Hawai’i.” https://www.volcanodiscovery.com/maunaloa.html but CO2 can be measured there, to an accuracy of 0.0009%? OK, that’s not fair, to an accuracy of 0.0012%. Hmmmmm……I’m certain there’s a rational explanation for siting a CO2 monitoring station on a volcano but as a layman, for the life of me, I can’t image what it is. It seems a bit like Anthony’s objections to temperature measurement stations being sited next to air conditioning vents. However, it’s accepted by the scientific community so it’s not for me to question it. So, I’ll refer back to my earlier paragraph describing CO2 as the mother of all greenhouse gases. I had an exchange with Kristi on another thread about the mixing of atmospheric gases and the subject of scientific averages. Kristi quite rightly maintained that energy is passed between atmospheric gas molecules by simply bumping together, and my apologies if that is too simplistic a description of her point, however, assuming I interpreted it correctly, CO2 is such a powerful greenhouse gas that at a saturation of 0.12% of all greenhouse gases, and 0.0012% of all atmospheric gases, it dominates everything, despite what John Tyndall maintains, and as an unevenly mixed atmospheric gas, it somehow transfers all it’s negative qualities to every other molecule no matter how distant they are. And yes, I get there are unique infrared qualities CO2 retains but really, it seems to me it’s something like the effect a single firefly would have in a jungle. As for the average surface temperature of the planet, it’s a theoretical starting point, it’s almost meaningless. As with all averages on this scale, one could traverse the planet and never once, other than by sheer coincidence, stumble upon a single place, in a moment in time, that conforms to the scientific average whole number, never mind to a fraction of a degree. So back to Kip’s point. Isn’t it simply miraculous that, as far as I’m aware, the only empirical manifestation of increased atmospheric CO2 on the planet is that it has greened by 14% in the last ~30 years, and ~70% of that has been attributed to increased atmospheric CO2 by NASA themselves. Think about that for more than a millisecond, that’s utterly staggering. If mankind’s CO2 emissions of 0.12% of all greenhouse gases can have this enormously beneficial effect, with no empirically demonstrated downside, what on earth (literally) are we doing wrong? I could go on but it would get terribly boring (assuming it isn’t already), however, I’ll finish on one point. The number of scientist’s on this planet is probably in low single digit percentages. There are, in fact more Indians that there are Chiefs. I have this bizarre notion that good working practices begin with a manager of any description (the Chief) being an advocate for his subordinate (the Indian), no matter how humble both stations are. ‘Intelligence’ comes from the ground up, a concept the armed forces are well aware of, so listening to, and representing subordinates in the chain of command is vital in any successful organisation. Equally, instruction from the top down must also be clear enough for an uneducated soldier to understand. In the same way, scientists bear the awesome responsibility of undertaking their incredibly complicated work, exploring concepts from the ground up, but with the added responsibility of communicating with the layman i.e. me. in terms we understand to convey the lessons he/she learned. Other than on very rare occasions, I don’t see that happening in science, I feel like science is dictating to their subordinates, and that’s not right unless science and its community operates for its own benefit, and then that gets scary. I’m a layman. If what I have tapped out on my little PC is what I understand, and I’m wrong, then scientists aren’t doing their job properly. Hot ==> It was a hard slog, but I made it through. The Zhu et al. is @ DOI: 10.1038/NCLIMATE3004 and is a good read. Nearly all pragmatic scientists would privately agree that CO2 is not the major driver of climate on Earth — but as you know, like Zimmer, they dare not say so is speech or print. Sad state of affairs. If The Zhu et al. is @ DOI: 10.1038/NCLIMATE3004 is a scientific paper, I’ll be asleep before the end of the first paragraph. I’ll try it, but don’t say I didn’t warn you. And if my rubbish was a hard slog for you, imagine how difficult it is for 99% of the planet’s population to deal with scientific papers. Zzzzzzzzz……. Hot ==> Wakey Wakey — don’t give up. There is valuable information in there somewhere, even if just in the pictures…..
Don’t sell yourself short. You understand CO2 ‘climate science’ better than many that claim science PhDs. Keep asking questions and seeking verifiable, repeatable results. It is the very foundation of the scientific method. My blunder, I did mean the climate scientists, not science in general. I discussed the question of repeatability with my scientist daughter and it’s considered a real crisis amongst contemporary responsible scientists. I’m flattered that you, Kip and J Mac even bothered to read it far less comment on it. But like I said, it’s my understanding of the situation. The problem sceptical scientists have is that they just aren’t good at getting these digestible chunks of information out to the public. It’s taken me years to realise the amount of man made CO2 in our atmosphere. Just using the number 0.0012% would make the public sit up and take notice, imagine it splashed all over the MSM headlines. More importantly, imagine it going viral on Facebook and Twitter. And what a nice, memorable title for a blog or website on the subject – Zero Zero One Two. Found it, recognise it, just didn’t know it was called the Keeling ‘curve’. And as you say, I have no idea why it’s called a curve. I wonder if it’s worthwhile me putting together a layman’s guide to climate change, I doubt it would be good enough to be published here though. But a good exercise for me to clarify things in my own mind. Hot ==> The line drawn connecting the dots (data points) on a simple line graph is called “the curve” — regardless of its shape. Funnily enough, I remember that from secondary school. Also that a circle is mathematically nothing more than a series of straight lines joined together. A crude description but I believe true. However, perception is reality. And when, perceptibly to the layman, a ‘straight’ line is presented as a curve, by informed scientists, the layman nods and smiles, but whispers to his mate “Bollox”. The perfect motor car is out there somewhere, but no one would ever drive it, not even scientists. It should be obvious to any thinking person that the only good place to monitor earth’s CO2 centrations is on a volcano where CO2 is belched out from the innards of the earth by the ton daily. Really, where else on Mother Earth’s 200 million square miles could we possibly put our most often cited CO2 monitoring station? Why the heck is there a CO2 monitoring station on Mauna Loa? It is sort of isolated, but it is certainly not isolated from any concentrated sources of CO2. Makes the sensors in my aluminum foil hat go off. The data for the Keeling curve is likely just fine. If it were effected by gasses released from Mauna Loa it would not have the shape that it does. The figure shows the linear increase along with seasonal change and second figure shows the linear increase in CO2. Well, WMO presented the network of CO2 measurements and the rate of change with years and seasons [in my book “climate change: Myths and realities”, 2008, pages 127 to132]. The CO2 presents a non-linearincrease from around 1740 to 1980 [Figure 8b] and seasonal variation with non-linear yearly increase [1973 to 1986]. cont— WMO compiled data relating to CO2 and stations recording it – WMO Fact Sheet No. 4, August 1989. Figure 8c is from this report only. Figure 8b is from Siegen Thaler & Oeschger, Tellus, 39B: 140-154, 1987. Figure 8d presents the total global level fossil fuel consumption for 1960, 1980 & 2000 for the Southern Hemisphere [SH] and the Northern Hemisphere [NH]. The projections for the year 2000 compared with those of 1960 indicate that consumption will have more than quadruples in the SH, while that in the NH will have more than doubled in relative terms but in magnitude the NH consumed more over the SH. From the WMO Fact sheet No. 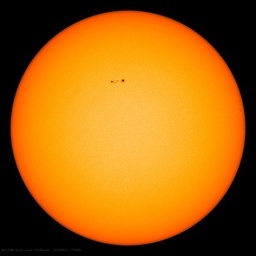 4 it is clear that very few stations are measuring changing composition [Figure 8e] of the atmosphere, including the increases of greenhouse gases [CO2, CH4, N2O, O3, CFCs] especially in tropics [by that time no data] and the SH [by that time only three sites]. With such data sets, presenting unbelievably smooth curve, scientists are filling the literature with highly hypothetical inferences. Dr. Reddy – Thank you for your work. Talk about grasping at straws (plastic ones) to support an untenable hypothesis. The desperation is palpable. Well, what this garbage really is, is proof that it was never about the well-being of living organisms in the first place. Exactly what is being done in many parts of the world. Use ‘The Great Green Wall’ ‘greening the desert’ and other similar phrases to search on YouTube. It appears that literally hundreds of millions of trees are being planted by people. This frequently or usually leads to many other types of plants being able to survive in those areas — and often considerably more. but in Aus of you do that on your own land- at your own expense- and PROVE it works? it was a world class example of good soil n land management in action. Its quite likely that grasslands sequester more carbon than woodlands. The carbon becomes sequestered in the soil. Despite the huge quantities of manmade CO2 emissions, atmospheric CO2 did decrease year-over-year in some of the global cooling years from 1959-1974*. Has this not happened recently because of increased humanmade CO2 emissions, or because the world has, until recently, been getting warmer? Modern CO2 data collection at Mauna Loa started in ~1958. One of the many things wrong with this objection to global greening is the delusion that CO2 is the only thing controlling the climate. Competent scientists know that plans have a cooling effect, so global greening has an effect on temperature in addition to CO2 reduction. Excellent post Kip. I appreciate the cogent discussion of CO2 uptake and the insights into Zimmer’s faulty logic. Strawman arguments and other red herring fallacies are so common these days we sometimes don’t see them for what they are. Pointing them out as well as you do is a great service. Thanks. Andy ==> Thank you Andy. One more short essay in this series … the horror of Global Greening not lasting forever. 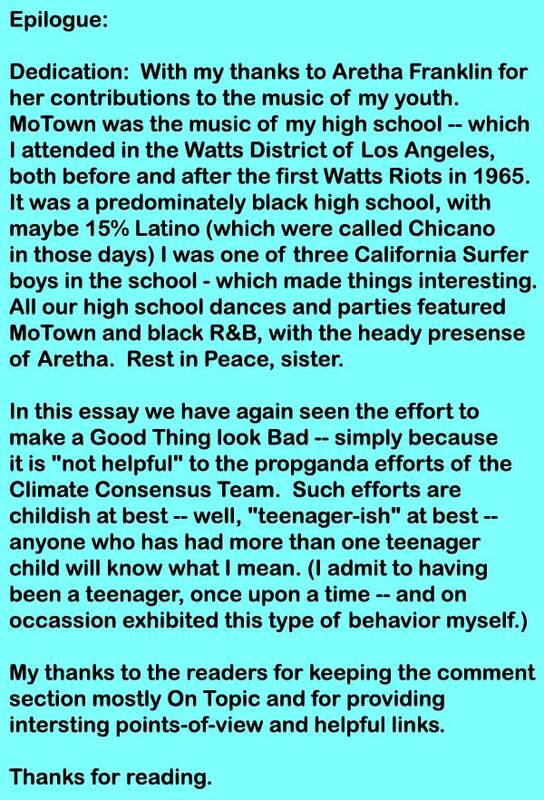 So, in other words…”It’s no good reducing CO2″ by the amount that China (the worst emitter) produces unless we can somehow control the lives of our less enlightened citizens and maintain the illegitimate power we scientists have accumulated by this obvious (to anyone familiar with the truth) leftist conspiracy…involving: the MSM, the Universities, and the Deep State, and sadly most scientists in every field of science. My old aluminum hat (tin is so out of style and its effectiveness is still unproven) is almost completely worn out. But who out there is going to protect me and mine from this evil. It is big and it is real. Kip, I’ve been commenting on the greening frequently here through a long period when advocacy scientists have been silent about this obvious positive benefit of increased CO2. I’ve hammered on the exponential nature of the greening (from a thought experiment on the advance of green fringes into arid areas adding to the area of new plants plus fattening of the existing stock). Moreover, the greening is an endothermic process, using up part of the energy budget. I calculated this as the energy content of 10Btpa of anthracite coal plus 10%. They definitely dont want to mention this cooling effect. Nor do they want to credit the reduced demand for water by global plants. The greening is the first unequivocal palpable evidence of manmade climate change and the climate alarm folk didn’t want to talk about it. With world population growth attenuating to peak at ~9B, harvests burgeoning, global poverty reducing, abundant resources I’ve been touting a Garden of Eden Earth^TM by mid century or thereabouts. I have a feeling that my flailing on this may have attracted some notice and that they had to do something- it is the elephant in the climate change changeroom. Their response shows that they weren’t well prepared to do proper battle.. 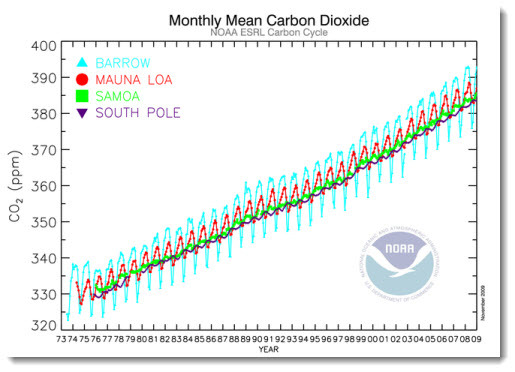 The negative comments about measuring CO2 on Mauna Loa are misplaced. Folks need to read what is done there, and how it is done. It will only take about 1/2 hour. After that, make your suggestions on how to do it better, and where. Pity this graph stops early but it clearly shows CO2 rise. I wonder where its all coming from? I didn’t get the impression that their analysis included CO2 extraction by phytoplankton. That seems a significant omission. It might not be if CO2 is not the major limiting factor in their growth- and I know people have tried stimulating growth via iron fertilisation- but that cannot be global. I am certain we can expect global greening of phytoplankton as well.